There were 2 restaurants in Perth that I liked a lot, and both were near our hotels. Both were near the shopping streets of Hay St and Barrack St. Mom liked the pancakes in Australia, so she brought us here for breakfast. Rare treat to have ice cream in the morning! escalators between Cue and Saba just off Hay St Mall. Mom said this is a famous and popular restaurant in Australia, so queue we must! Kids Menu on the reel! Friends always recommend that I try Jamie's Italian when in Australia, and while we are no gourmands, we were not disappointed. It is possible to do a walk-in during off-peaks (lunch and dinner times are super crowded with a waiting time of 1-1.5 hours to get a table), so we did not have to queue when we popped in for a late lunch at about 2pm. Order the smaller portions to try a variety of dishes. The highlight for kids is the view master menu, and even I found it fun! Labels: Australia, Hay St. 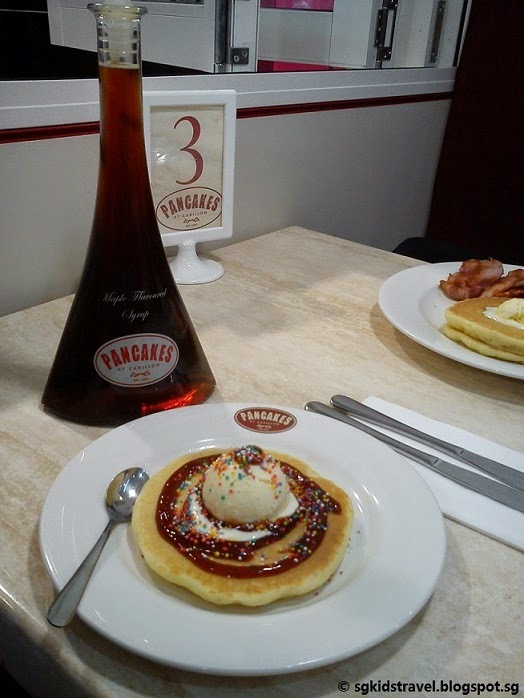 Mall, Jamie's Italian, Pancakes @ Carillon, Perth, Perth CBD, William St.